Bill and Melinda Gates FoundationBill Gates holds up a beaker of human faeces at the Reinvented Toilet Expo in Beijing on November 6, 2018. Bill Gates thinks it’s not practical for the entire world to adopt flush toilets, so he’s spending $US400 million to fund research into toilets that don’t require a sewer system. Bill Gates isn’t afraid of potty talk. Earlier this month, he got onstage in front of business leaders, investors, and government officials from around the world and unveiled what he politely referred to as a “little exhibit.” It was a glass jar filled with human faeces. 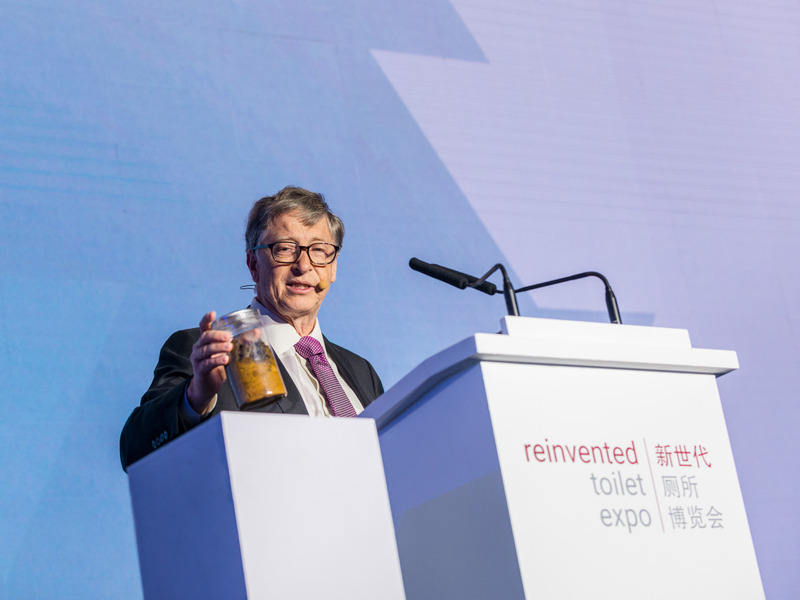 “It’s good to be reminded, in there could be over 200 trillion rotavirus particles, 20 billion Shigella bacteria, and 100,000 parasitic worm eggs,” Gates told the crowd, which had gathered in Beijing, China, for an event called the Reinvented Toilet Expo. The jar of poo was used to make a point: Around the world, in places without proper sanitation or sewage systems, there’s much more than a jar’s worth of unsanitary human waste sitting around. “That’s what kids, when they’re out playing, they are being exposed to all the time,” Gates said, noting the link between bad sanitation and disease, death, and malnutrition. 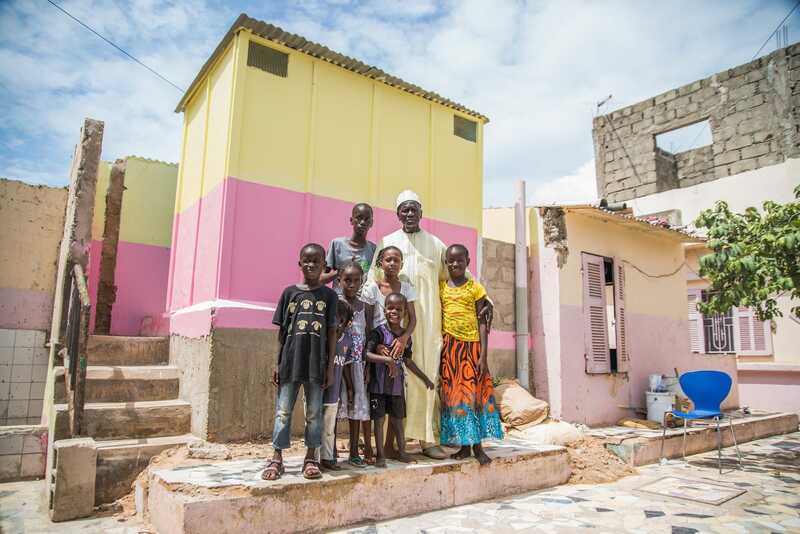 To address that problem, the Bill and Melinda Gates Foundation started its Reinvent the Toilet Challenge in 2011. The initiative funded $US200 million in grants for universities around the world to develop a next-generation toilet. The goal: develop a waste-processing system that doesn’t need to be hooked up to a typical sanitation and sewer grid. 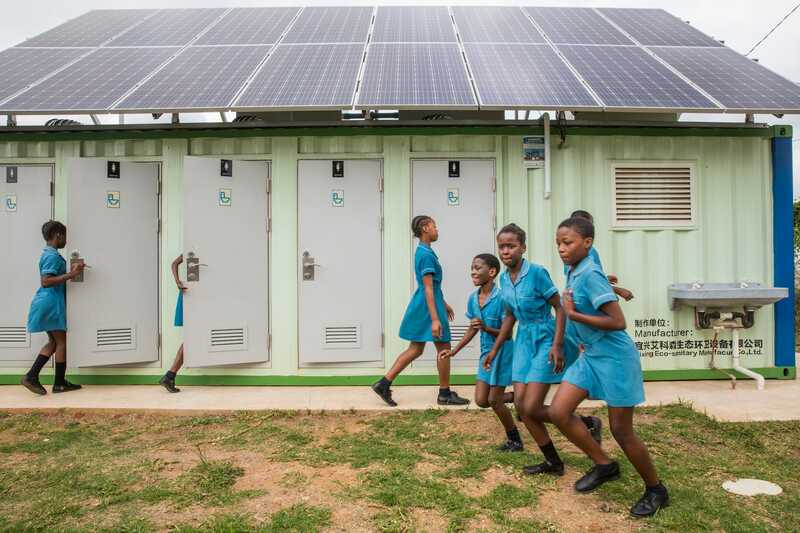 New systems that have been created with those grants turn what we put into the toilet into fertiliser, energy, or recycled water – some of which is good enough to drink. The Gates Foundation now intends to invest an additional $US200 million into research that can yield additional ways to deal with human waste at the source. ©Gates Archive/Sam PhelpsMalickane Gueye stands with his children in front of a newly constructed toilet at his home in Dakar, Senegal on September 25, 2018. In 2015, the World Health Organisation estimated that just 39% of the world’s people were using a “safely managed” lavatory, whether it be a toilet or a decently clean latrine. Living without a good toilet can be unsafe. People who come in contact with faecal matter face a risk of deadly infections and chronic health problems, since human faeces carry pathogens like E. coli, Streptococcus, hepatitis A and E, and more. Those can cause pneumonia and diarrhoea – the top two killers of kids around the world. Plus, if people don’t have a place to go at home, they have to travel alone into woods or a field to relieve themselves, which can be risky for women and children living in conflict zones. “When you think about things that are basic, right up there with health and enough to eat, I think having a reasonable toilet certainly belongs on that list,” Gates said. He estimates that illness from poor sanitation costs the world over $US223 billion per year in lost wages and extra healthcare. “Unless we do something, the cycle of disease will actually be accelerated,” Gates said. Gates doesn’t think it’s practical to expect the entire world to connect their homes to yet-to-be-built sewer systems and wastewater-treatment plants. That’s why he has been on a quest to do for toilets what he argues Microsoft did for computing: get the business off a centralised, “mainframe” system. “A decade ago, I didn’t think I would be able to tell you so much about poop,” Gates said. After seven years and $US200 million of investment, the first batch of products from the “Reinvent the Toilet Challenge” is being tested in locations around India, Africa, and China. ©Gates Archive/Shawn KohAn Eco-san Toilet at Yixing Huankeyuan Elementary School in Yixing City, Jiangsu Province, China. The University of South Florida’s NEWgenerator treatment system also runs on solar energy and can be hooked up to any existing toilet. It uses a nano-membrane filter (kind of like a coffee filter) with faeces-digesting anaerobic bacteria inside to filter clean water out of the waste. Yet another model, from Swiss engineering firm Helbling, is called the HTClean Toilet, and it functions like a pressure cooker for poo. The immense pressure and heat help the waste separate into water and solids that aren’t toxic. 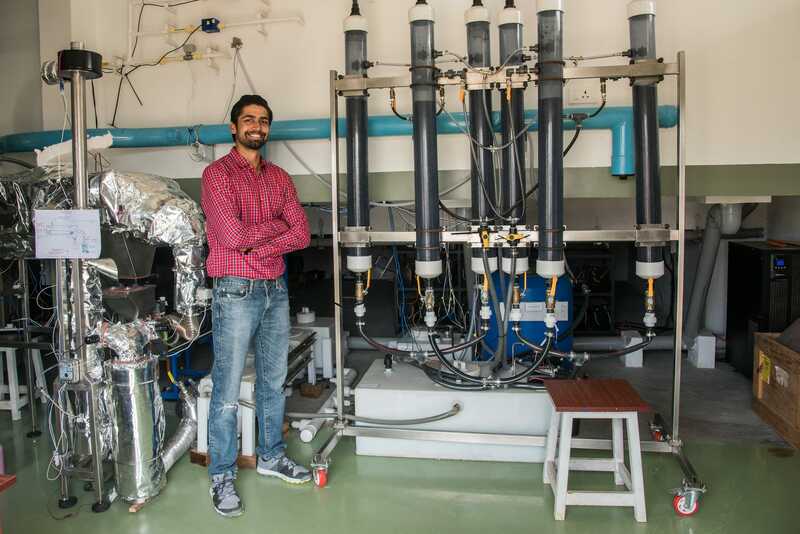 ©Gates Archive/Ryan LoboPrateek K, a technical field consultant engineer, stands next to the Duke system, which dries out faecal matter and separates parasitic worms from faeces, allowing for water to be recycled or discharged. None of these sewer-free toilets are currently at a price that’s feasible for individual homes. For now, the new toilets are going to be used at schools, apartment complexes, and community bathroom areas, Gates said. But his eventual goal is for off-grid toilets to be used in homes around the world. 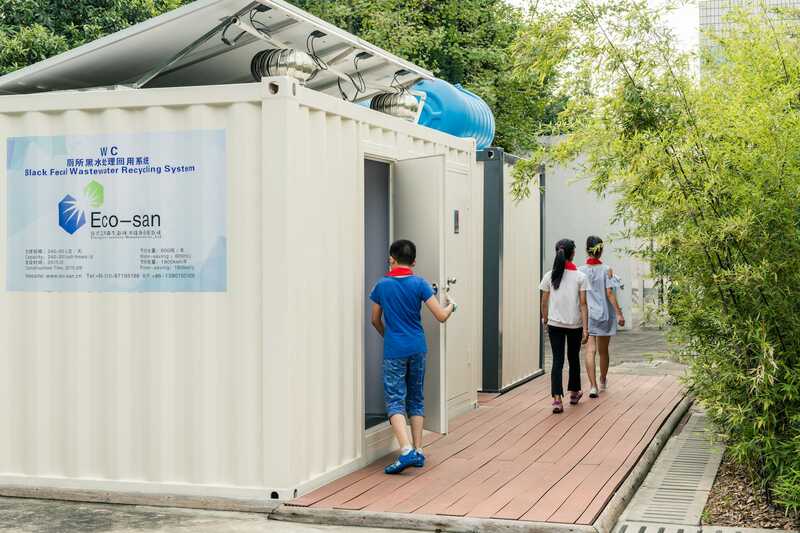 He told the crowd in Beijing that he’s ready to spend an additional $US200 million developing the technology for those next-generation toilets. 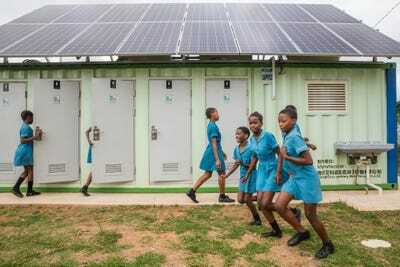 But Gates hopes someday the private sector will start developing sewer-free home toilets and compete to provide those toilets to the 4.5 billion people around the world who don’t have them now. “We estimate that by 2030, the opportunity here is over $US6 billion a year,” he said. ©Gates Archive/Samantha ReindersChildren at the Gugulethu Primary School in KwaMashu, outside of Durban, South Africa. The school is a recipient of a new Eco-san toilet system. 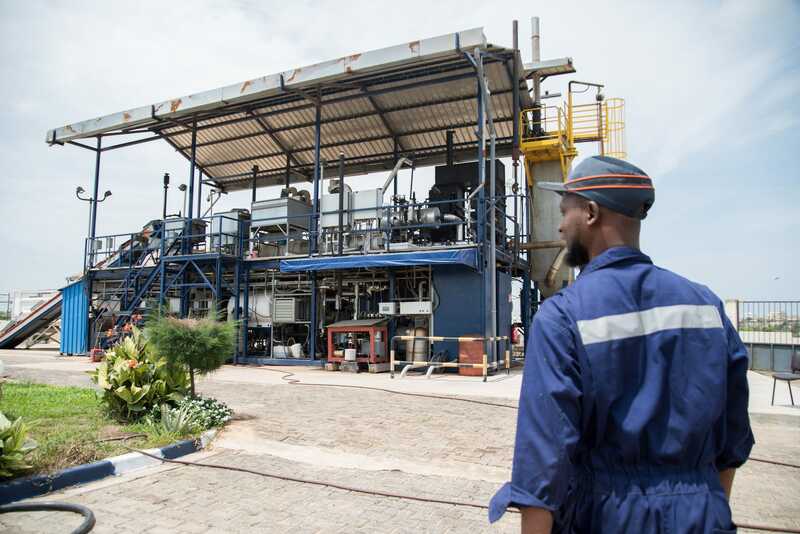 The small plants, one of which is already on the ground in Dakar, Senegal, can serve between 5,000 and 100,000 customers and are completely self-powered. They take in toilet waste, kill pathogens in the sewage, and convert it into “products with commercial value – like clean water, electricity, and fertiliser,” Gates said. It’s a lot like what astronauts do on the International Space Station – turning their pee into clean, drinkable H2O. 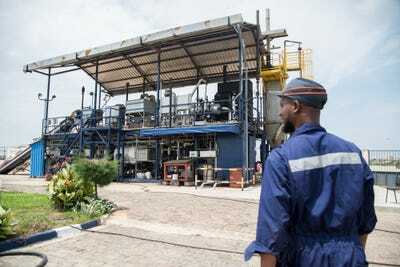 ©Gates Archive/Sam PhelpsTechnician Idrissa Coulibaly walks to the Janicki Omni Processor in Dakar, Senegal on September 25, 2018. Gates is so enthused about the Omni Processor’s clean, recycled water that he once drank it himself. 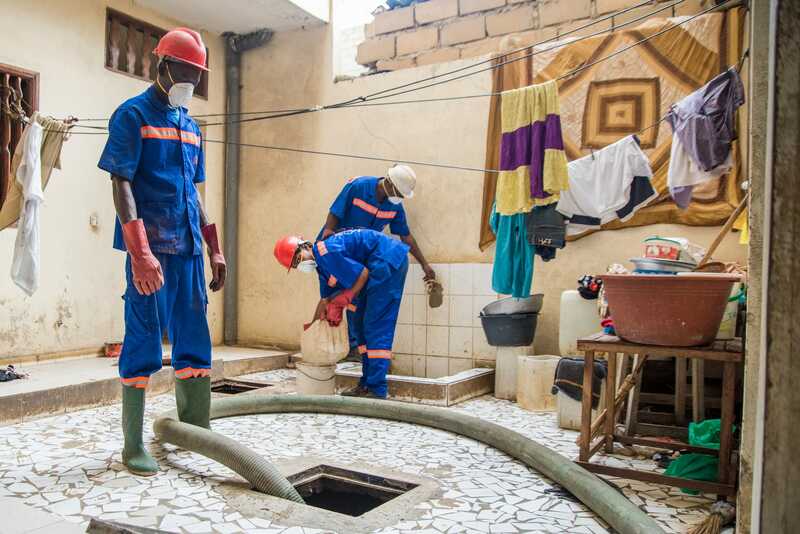 ©Gates Archive/Sam PhelpsWaste collector Assane Cissé (left) and Mariama Seck vacuum human waste from a reservoir inside a courtyard. That waste will then be transported to the Omni Processor in Dakar. Gates never thought that he’d turn from a computer whiz into a toilet geek. 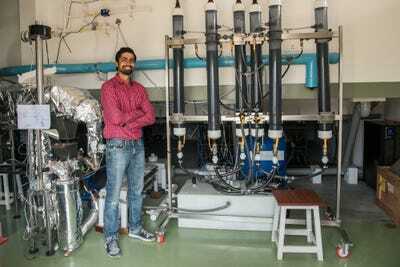 “I definitely didn’t think that my wife would have to tell me that in some cases I’m talking too much about toilets and how this science of combusting the faeces works,” he said. But he’s committed to the task, since better toilets could help save millions of lives and open up an entirely new market. “A whole new product category is being introduced here,” Gates said. This story was originally published on November 6, 2018.